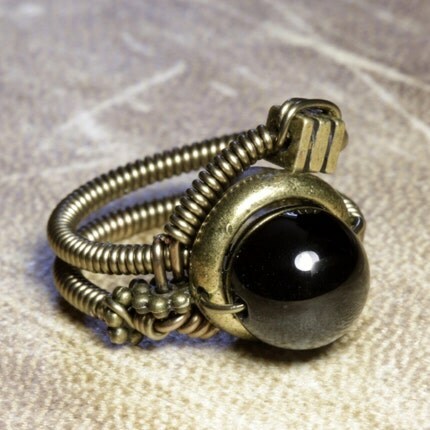 Steampunk Jewelry Rings: Steampunk Jewelry Giveaway : What is your favorite stone ? Steampunk Jewelry Giveaway : What is your favorite stone ? The winner have been contacted ***. This is a quick survey and giveaway , Ending on the 31st of august 2009 . Please indicate which stone is your favorite from the list below , the color of Metal you prefer . There will be 1 winner for every 100 participant . The winner will receive the most popular ring from the result of the survey . All you have to do is leave a comment here and letting me know what you did. Also, my favorite is the Green Seraphinite with Gunmetal. Red Coral with gunmetal is my favorite! Charoite and gunmetal with natural copper - love your work. SMOKY QUARTZ with Gunmetal with Natural Copper. I like the amber in gunmetal. I did a post on my blog with the required links. I'm a fan of the Green Seraphinite in Gunmetal with Natural Copper! The amber with gunmetal is my favorite. Lapis with gunmetal. Is V Nice. Smokin' Smoky Quartz /Gunmetal/Copper ! It is possible to contact me for an upgrade to sterling silver . Red Coral with Gunmetal - fantastic! The SMOKY QUARTZ with Gunmetal is my favorite. Beautiful! Favorite is Seraphinite and Gunmetal! I added your icon and link to my blog - who doesnt want 4 more entries? LOL Plus I really like your jewelry! Your icon is in the sidebar! The LAPIS LAZULI with Gunmetal with Natural Copper is definitely my favorite from this list, the color contrast is so beautiful. Amber with gunmetal I blogged about your store. I'm going with CHAROITE with gunmetal but the black onyx was a close second. I vote for Green Seraphinite with gunmetal. CHAROITE with Gunmetal is so gorgeous, my FAVE by far!!! Green Seraphinite in Gunmetal with Natural Copper -- but all your work is fabulous! amber with the gunmetal and copper is awesome! I like the smoky quartz with gunmetal best! Charoite with gunmetal is my fave too! I posted my favorite earlier (amber and gunmetal), but now I'm posting to say that I posted a link to your store in my blog, using the image you provided. Four more entries gets me four steps closer to winning one of your beautiful rings! Really, they are all quite lovely. All of them are fabulous but my favorite would be..
My favorite is the Lapis Lazuli with the gunmetal and copper. I added your Esty shop on my blog! I love all the rings! Absolutely and totally love this ring! Charoite with Gunmetal is gorgeous. I think I like the smoky quartz with the gunmetal and copper. I thought it would be the Lapis, but after seeing the pictures the quartz wins out. I added a text and photo link to the shop on my blog, along with a post linking to your blog. I know it doesn't add an entry, but I wanted to pass the word along anyway. The jewelry is great! I had a hard time finding my fave, but I did like the Black Onyx with Gunmetal. Does it come in silver and the style the Lapis Lazuli ring was done in? i am in love with this design! i think if i had to pick one, i'd go with the red coral. or the amber. Smoky Quartz is my favorite. Beautiful rings! My favorite is the Green Seraphinite with Gun Metal! Posted your button to my blog! 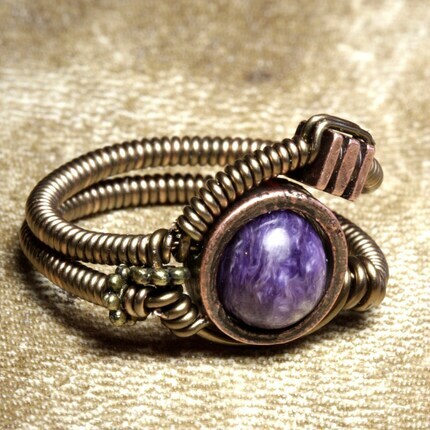 ~ popnicute - imaginative handcrafted jewelry. I also posted a link to your etsy shop on my blog! My favourite is Amber with Gunmetal. I've added your link and your 125 x 125 ad on two of my blogs, http://theadmaster.net and http://slightly sarcastic.net. I have your widget on the side of my blog and my favorite combo from the options given is the black onyx and gunmetal ring. I really like black onyx with gunmetal. i like the smokey quartz with gunmetal! Definitely the charoite with gunmetal. Gorgeous! Green Seraphinite and gunmetal with natural copper. Beautiful rings! Green Seraphinite is a must ! It stands out more than the others with it's green mystique! Stunning rings, I'm torn between a few but would have to pick the Charoite with gunmetal. Just gorgeous! I love the purple charoite one, because it matches my bagpipe uniform. Posted a link at the sidebar under "and..." and the graphic under: interesting for you. You can reach me easily by using "contact" under the topimage. Hmm it's a tough choice, but that SERAPHINITE with Gunmetal is intriguing, because I am a sucker for green. I LOVE the Chariote with the gunmetal... but I do like the addition of natural copper as well. These are gorgeous. Going to add your link to my Facebook page. I don't have a website. Lapis lazuli in Gunmetal with Copper. LAPIS LAZULI with Gunmetal with Natural Copper is best!! My favorite combination is the black onyx with gunmetal. Gunmetal with copper Thanks so much! Green Seraphinite with gunmetal is phenomenal! I can't take my eyes off that amazing piece of work. I love all your designs and creations! You are truly an inspiration. I LOVE SMOKY QUARTZ with Gunmetal with Natural Copper! Gorgeous!! blue lapis with gunmetal/copper! definitely. your stuff is absolutely amazing. I feel like such an amateur looking at it haha. I <3 the Lapis because it's the most striking with the metals, although the amber is also wonderful. CHAROITE with natural copper would be most excellent. i LOVE your stuff and it was hard to choose, but I think I like the green seraphinite with the gunmetal wth the natural copper the best. absolutely love the amber and gunmetal ring. Definitely the gunmetal and copper combo, but it is a real toss-up between the lapis lazuli and the smoky quartz. They both look fabulous! most definitely Charoite with Gunmetal. Awesome stuff! 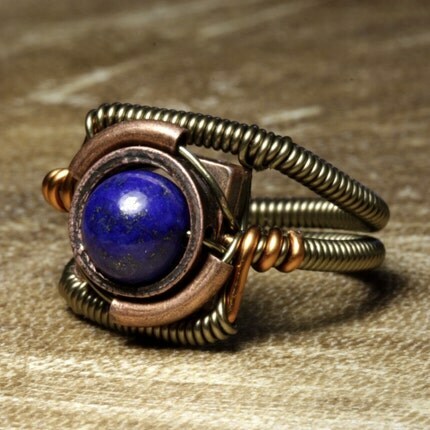 I am partial to the Lapis Lazuli in Gunmetal with natural copper. But I also really like the serarhinite ring. All very cool. Sending your link to a friend of mine that writes Steampunk. The Charoite with Gunmetal and Copper is my favorite of the bunch. That rich purple color is marvelous. Absolutely the lapis with the gunmetal and copper! I love all of your rings but my favorite is Gunmetal with Natural Copper and the orange Amber as the center stone. I'll be placing your etsy store on my blog and your ad too. It should be up by tonight. wth gunmetal. Thay are so pretty. I will add you link and a picture to my blog later today. Hmmm I would have to say my favourite is Smoky quartz with both the natural copper and gunmetal. I just add the website, picture with the hyperlink, and a glowing advertisment to my blog at http://sleepydoggie.livejournal.com/ so please enter me for the full amount :D Fingers crossed - these pieces are gorgeous! Seraphinite is my favourite. Though I must ask as I was only recently introduced to your work, do you ever work with malachite? and i'm posting you link in my deviantart account can i still get 4 more entries for that? If we post in two blogs do we get more entries than if we only post in one? Thanks for this contest! So kool! SERAPHINITE with gunmetal looks amazing! Gonna have to say that the amber with gunmetal is gorgeous! Love love love your work :D it's all so beautiful! Purple Charoite with the gunmetal is my favorite. My favorite is the seraphinite with gunmetal. I love them all! But I'm a real sucker for amber, and the gunmetal is very cool. So I vote amber in gunmetal (if you'd had moonstone as an option, I'd have been very torn). I'm loving all the combination...they are all delicious! I'd have to say my absolute fave is the Charoite with Gunmetal - but I really like the Gunmetal with Natural Copper metal better. Yay - thanks for a great contest! No contest. Amber with gun metal. My favorite is Amber with Gunmetal. I love the amber in gunmetal. My friends would love this and you can bet IO will be showing them your stuff! But - I think it could go with both metals as it is a tone that works well. I'd really like to see you get into the more gemstone beads tho. Like Opals and Sapphires and rubies. I think the pricey stones with your work would be interesting. Of course - the mystic topaz look is superb... Yanno? I'll try and get a post up on the blog soon - but no worries - I just think your stuff is cool... And I tell everyone about them anyway! I love the amber with gunmetal best. I added a link at the top of the right sidebar, and the graphic a bit lower al the left sidebar. You can reach me through the contactbutton at the top of the posting section. posted icon and link on livejournal!! But honestly I like them all but for purposes of your survey thingy I chose one. My fave combo is the lapis lazuli with gunmetal! Amber and Gunmetal with Natural copper. added your shop link and image in my right sidebar. What a generous giveaway! It was hard to pick just one. Blue Lapis Lazuli and Gunmetal with Natural Copper...actually, that first ring is my fave just the way it is...can't take my eyes off it! Has to be the Choriote and GUnmetal. I have some earrings in Choriote that I bought in Russia. it is something special! OK off to do the adding of things then I will report back! CHAROITE with Gunmetal is my favorite. Oh I love your work! Your bug sculptures are amazing. My favorite ring combo is the Green Seraphinite with Gunmetal. No question...Charoite is my favorite of the choices. It's tough though because I do love nearly all stones and Lapis would be a close second. And the metal I'd love is gunmetal. My favorite is the Amber with Gunmetal. My favorite is the Green Seraphinite in Gunmetal with Natural Copper! My favorite is the SERAPHINITE with Gunmetal with natural copper. I just saw your jewellery yesterday for the first time, and then today doing a different search came up with your survey giveaway. How serendipitous! Very beautiful work. I will be treating myself. Either for Samhain or Yule. 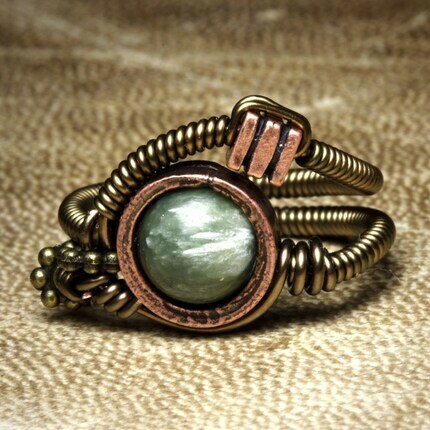 SERAPHINITE with Gunmetal and natural copper is my vote. I absolutely love your jewelry, by the way. Red Coral with gunmetal!! Lovely! Love Love, Blue,Green and Purple how to choose my fav ring. I'll go ahead and say CHAROITE with Gunmetal. Your rings Rock!! I added your picture and link to my blog! Love the seraphanite with gunmetal! Beautiful! Green Seraphinite with gunmetal is definitely my fav, but they are all beautiful! I hope I win!!! i like seraphinite with gunmetal the best. I like the SMOKY QUARTZ with Gunmetal with Natural Copper! I like the smoky quartz and gunmetal. 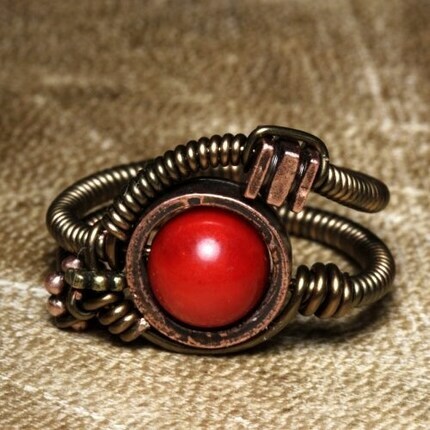 Red Coral and Gunmetal with Copper! I like the amber with gunmetal. LOVE the Amber with Gunmetal! Your rings are my absolute favorite on Etsy - so unique. 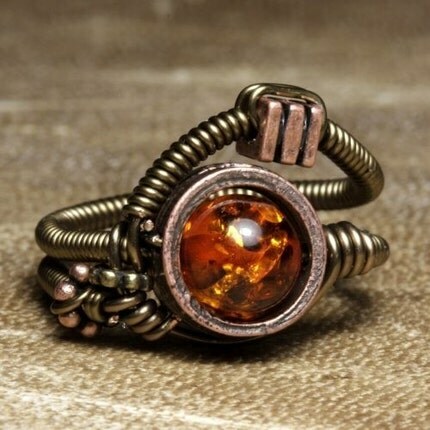 Amber with Gunmetal is gorgeous, I think it really says "Steampunk"! Thank you for your participation , the winner has been sent an e-mail . I would have to say the Amber is the most powerful looking one. Your work is very admirable. Thanks for sharing.